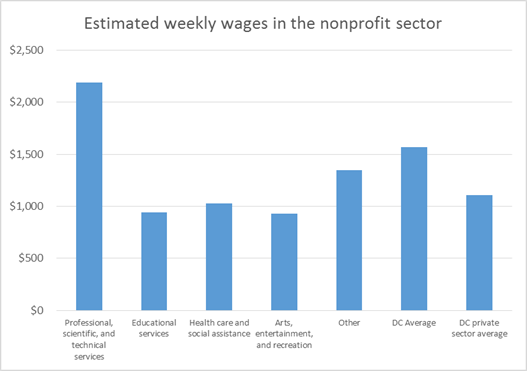 Today’s post on the District’s labor market prompted one question on the nonprofit sector in the District. The Economic Census gives us a full picture of the tax-exempt organizations, their employers, and their payroll, but the data are bit dated. The census is conducted every five years. The 2012 Economic Census is now complete but data release is not (all we have for DC is manufacturing data); we have to wait a year or so more to get the full picture. Therefore, we look at the 2007 Census to get a sense of the lay of the nonprofit land in the District. In 2007, the total payroll of the entities that were exempted from federal income taxes was about $16 billion. Over 10,000 entities in the District employed nearly 214,000 people. The sector payroll show us that professional, scientific, and technical services, and health care and social assistance organizations accounted for three quarters of total payroll. 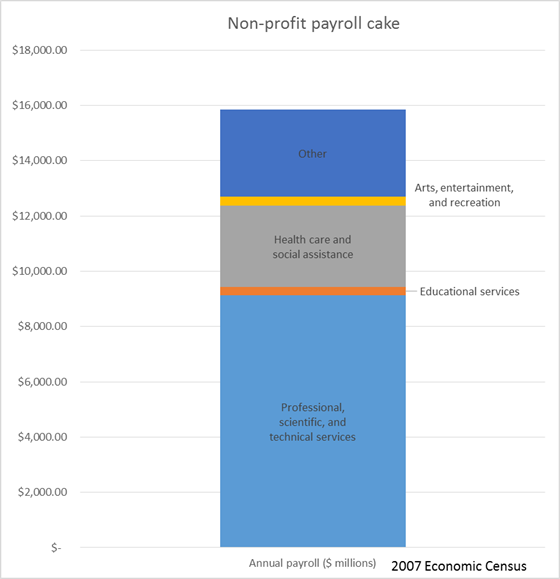 How much does the nonprofit sector pay? Taking the estimated weekly pay for 2007 and inflating it by the GDP deflator shows us that except in the areas of professional, scientific, and technical services, non-profit wages were below the DC average. Those working in nonprofits in education, healthcare, social assistance and arts earned even below the private sector average wages. This assumes that wages in the sector are growing at par with the economy. We will know more about how the sector did relative to the economy once the 2012 data is fully released.